Paula Bennett: As far as home schooling goes, the existing home school policy remains unchanged under the welfare reform changes. 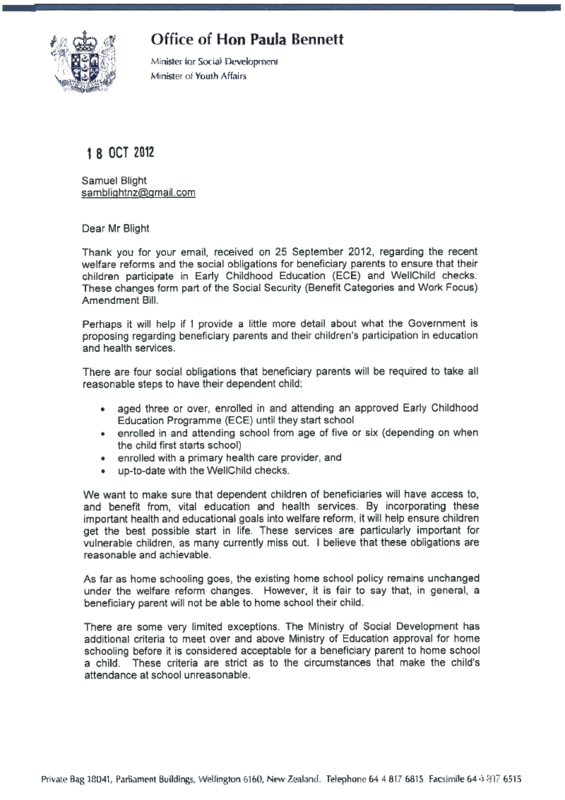 However, it is fair to say that, in general, a beneficiary parent will not be able to home school their child. Home educators we must all be putting in submissions. When you look at the White paper and Supporting Vulnerable Children then you will realise that the government wants this for ALL 3- 5 year olds. 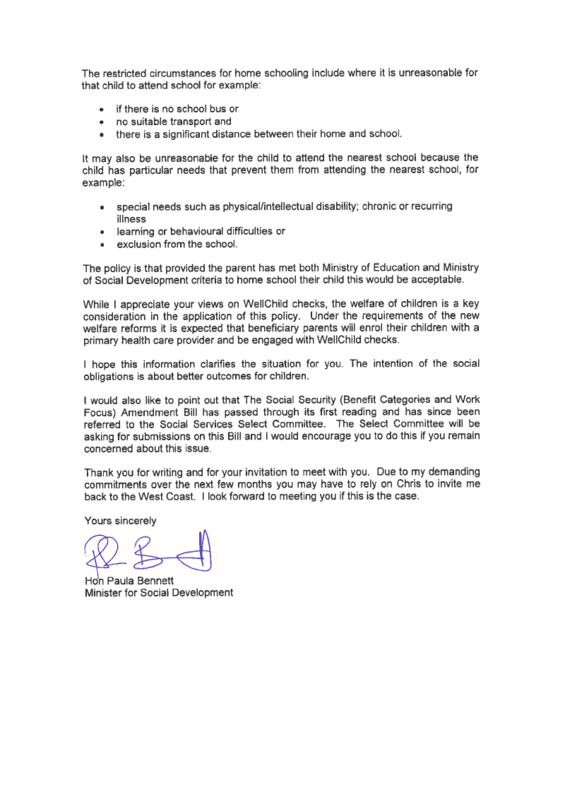 Paula Bennett claims her new social obligations which apply to “all” beneficiaries are reasonable. I am not going to repeat what others have said in terms of human rights and so forth which all do apply. I am only going to give an example of a situation and the select committee and those who voted for the bill can say if it is reasonable or not. You have a person who has paid his or her taxes while working and happen to have become disabled or sick which prevents them from working. They want to teach their children at home (homeschool them) for various different reasons (may be but not limited to the child having an extraordinary intelligence and NZ schools are not going to benefit that particular child). Considering that the social obligations seem to be for the purpose of pressuring the beneficiaries to go into work and this disabled and sick person cannot work then you are taking away their right to teach their children as they see fit. Shame on whoever is going to vote for this bill in its current state.